Habit: Annual, fleshy. Stem: prostrate or reclined, many-branched, brittle; angles +- glabrous, bristly, or generally with hooked prickles. Leaf: cauline, lower opposite, upper alternate; petioles generally winged, clasping; blade pinnate-lobed, uppermost reduced, short-petioled, generally deltate, 3-lobed, with small, sharp bristles both surfaces. Inflorescence: terminal, axillary, opposite leaves, or flowers 1; pedicels present. Flower: calyx lobes hairy, bristly-ciliate; corolla rotate, lobes +- = tube, generally hairy; stamens included, equal, equally attached; ovary bristly-hairy, chamber appearing 1, style 1, 2-lobed in distal 1/2. Fruit: capsule, spheric, stout-bristly-hairy. Seed: 1--8, spheric, brown, pitted or honeycombed. Stem: 5--90 cm, generally glaucous. Leaf: petiole narrow-winged, not clasping; lower leaves 2--13 cm, 1--8 cm wide, blade oblong to ovate, base cordate or truncate, tip obtuse, lobes 5--11, oblong, obtuse, entire or 1-toothed. Inflorescence: flowers generally 2--10 in cymes; pedicel 5--20 mm. Flower: calyx lobes 1--3 mm, oblong, sinus appendages 0; corolla 3--6 mm, < 10 mm wide, white, lobe generally with purple spot; style 1--3 mm. Fruit: 2--4 mm wide, not enclosed in calyx. Seed: 1--2. Chromosomes: n=9. Citation for this treatment: Robert Patterson & Richard R. Halse 2012, Pholistoma membranaceum, in Jepson Flora Project (eds.) 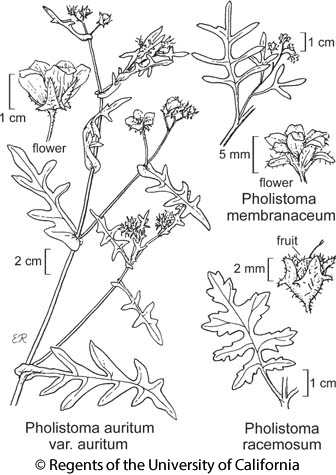 Jepson eFlora, http://ucjeps.berkeley.edu/eflora/eflora_display.php?tid=37886, accessed on April 19, 2019.
c&s SNF, Teh, SnJV, CW, SW, D; Markers link to CCH specimen records. Yellow markers indicate records that may provide evidence for eFlora range revision or may have georeferencing or identification issues. Purple markers indicate specimens collected from a garden, greenhouse, or other non-wild location.